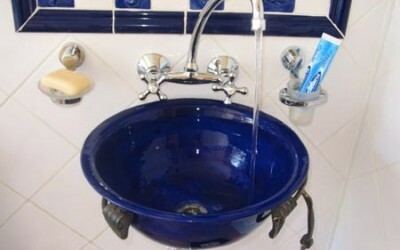 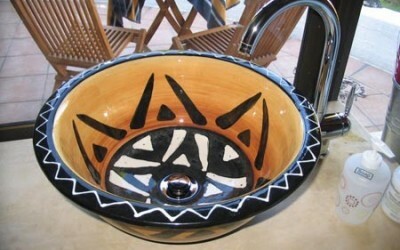 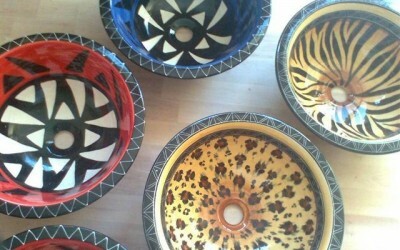 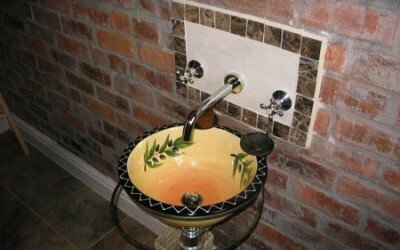 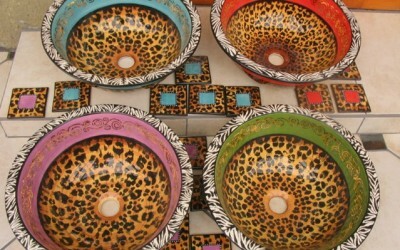 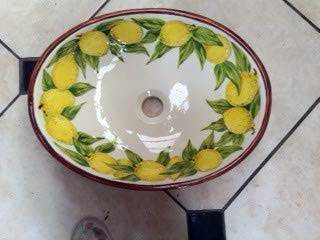 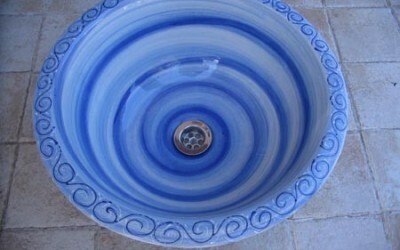 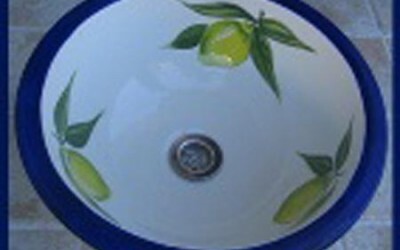 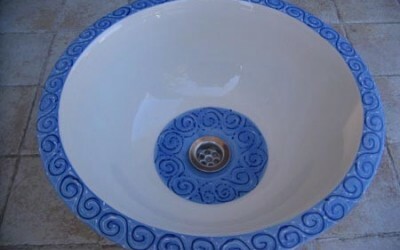 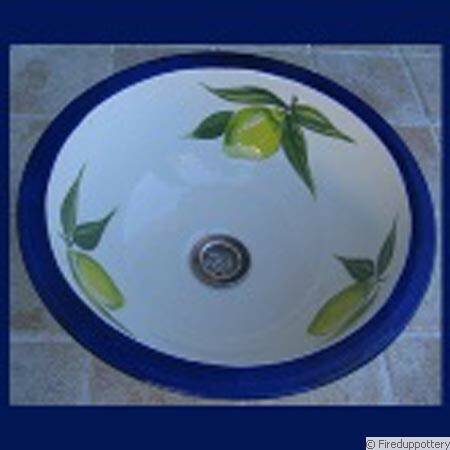 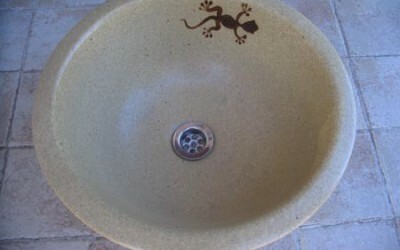 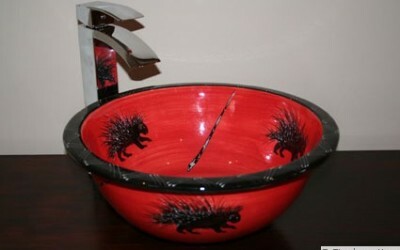 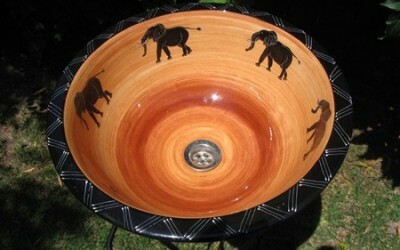 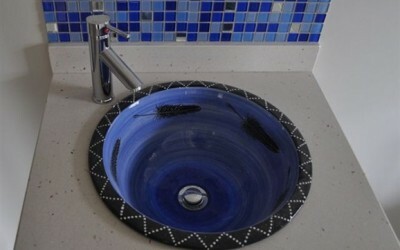 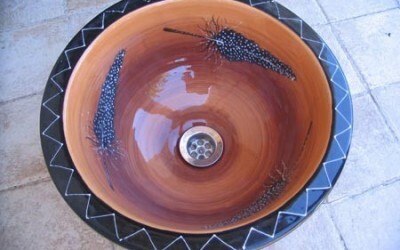 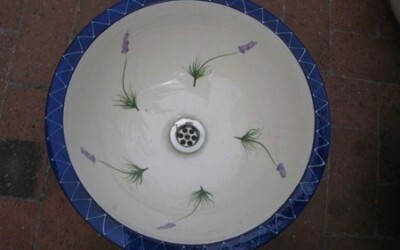 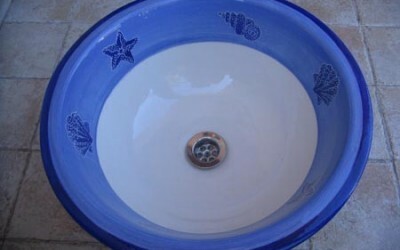 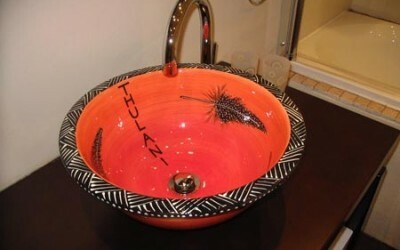 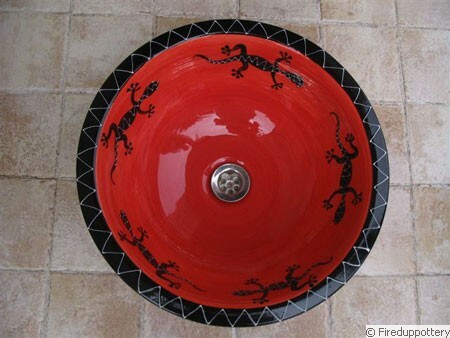 HANDMADE WASH BASINS, high quality, handmade basins. 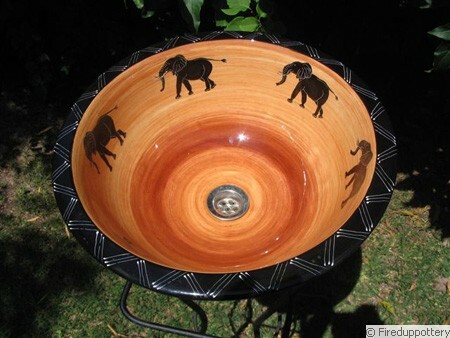 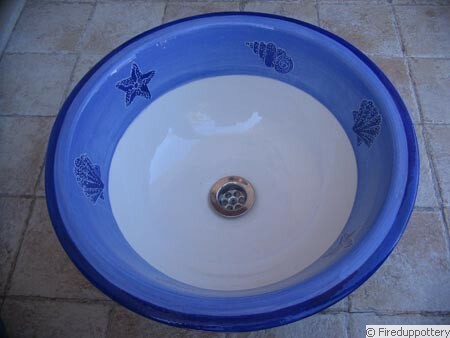 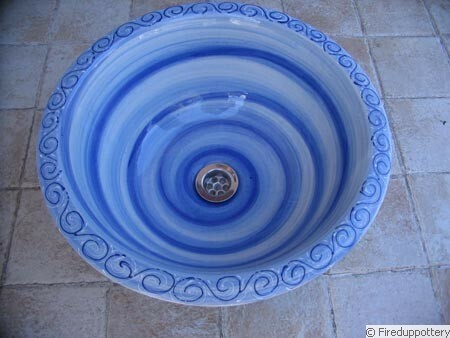 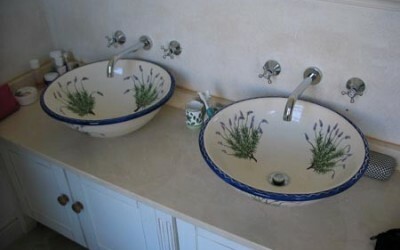 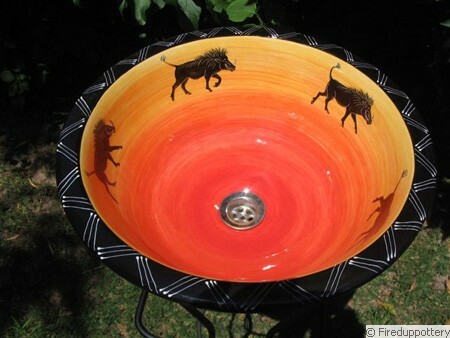 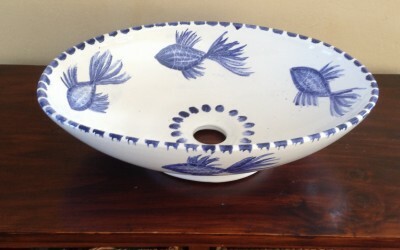 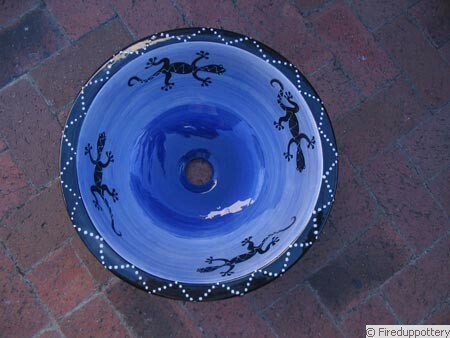 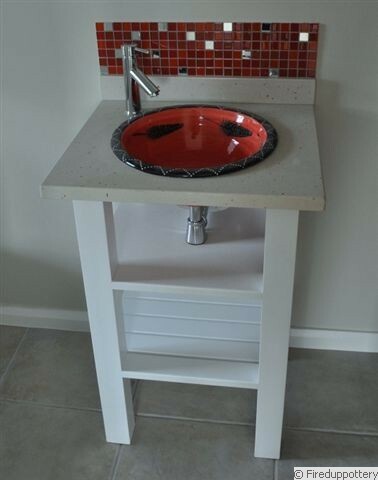 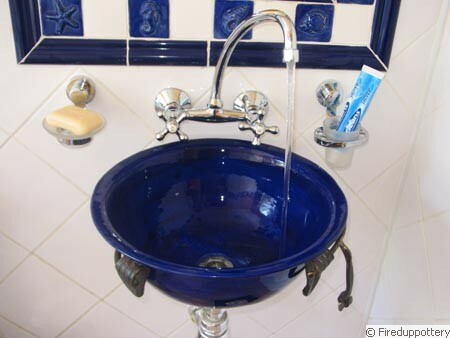 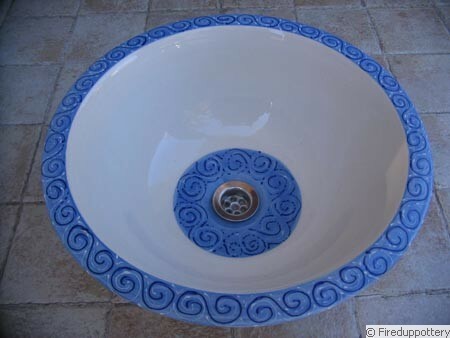 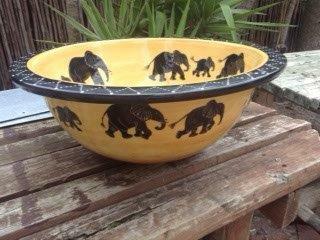 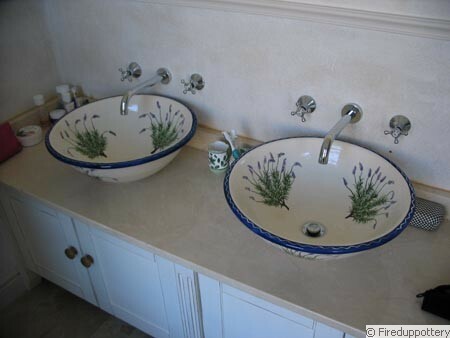 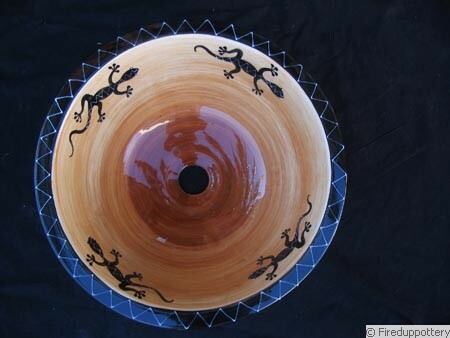 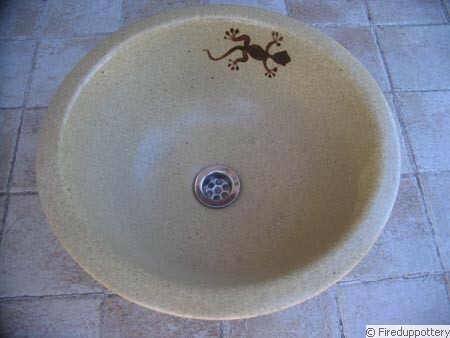 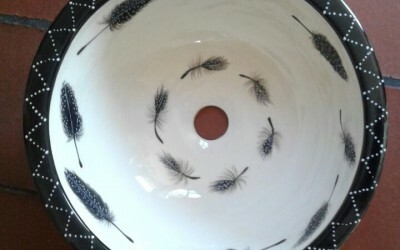 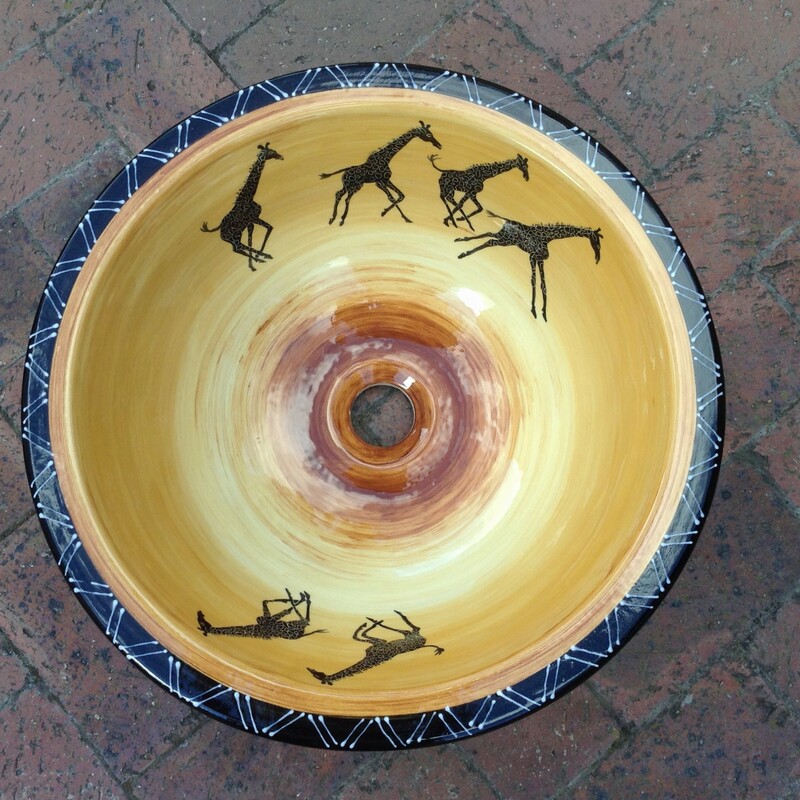 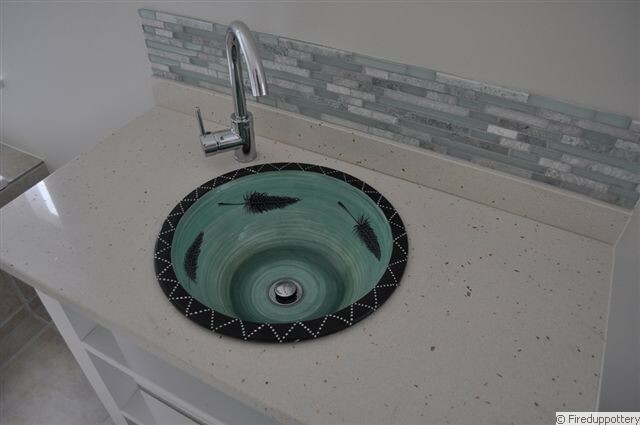 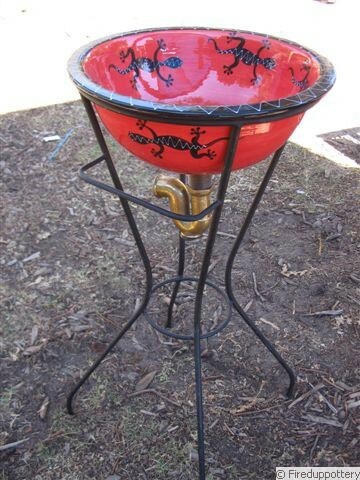 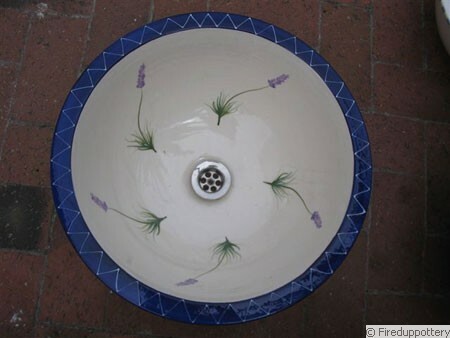 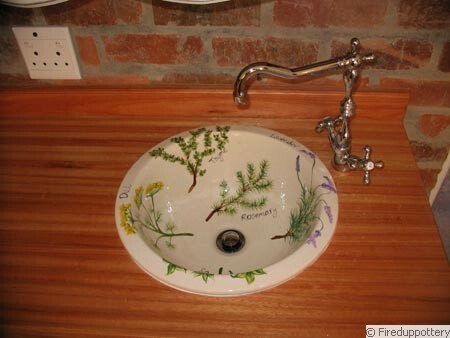 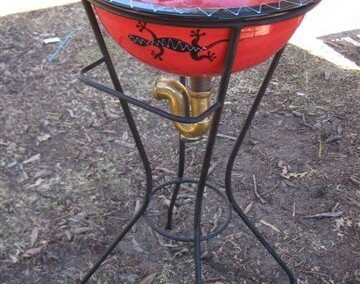 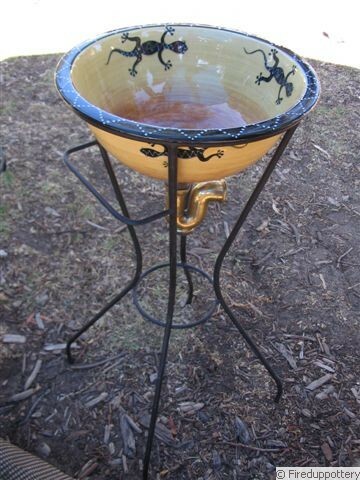 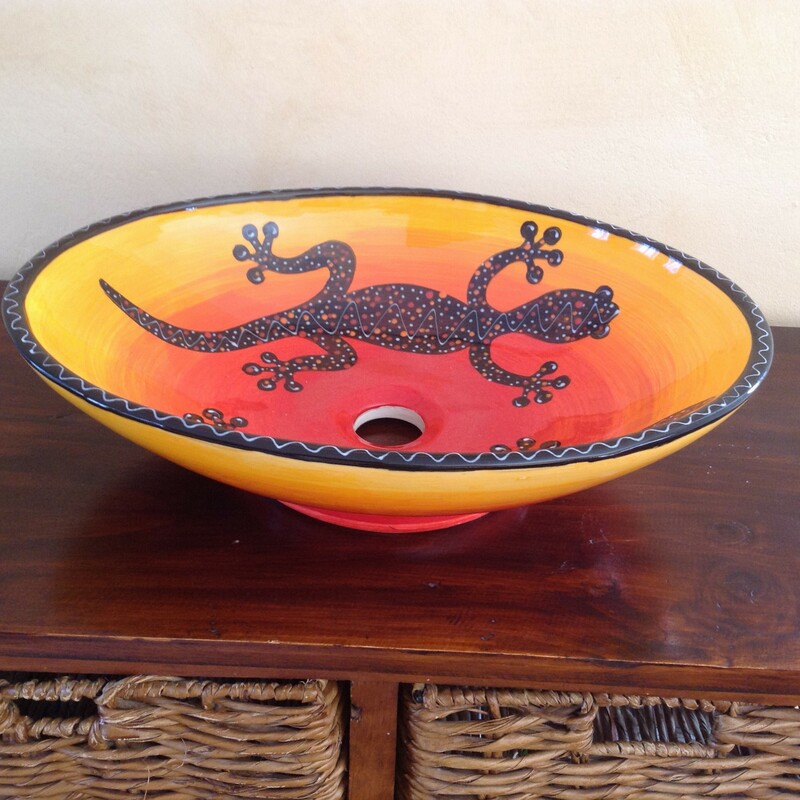 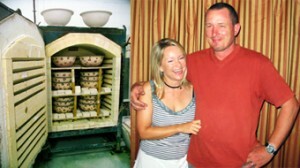 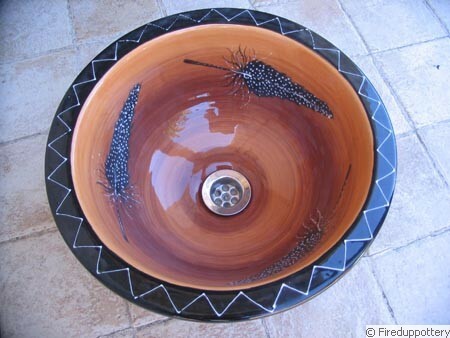 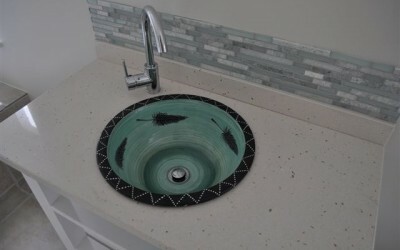 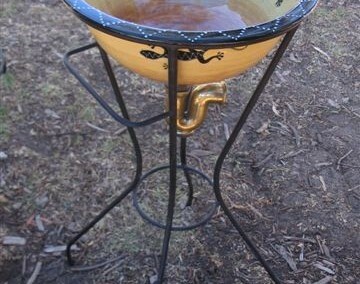 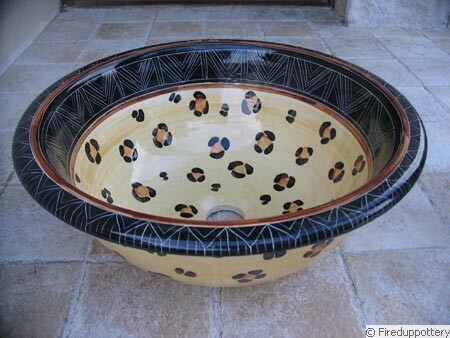 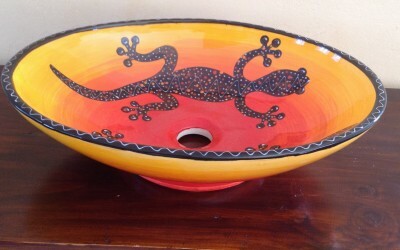 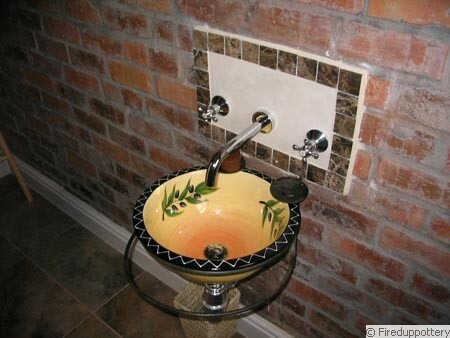 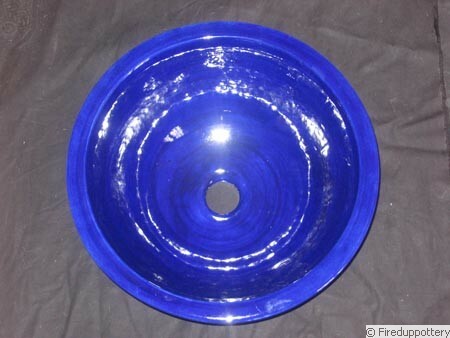 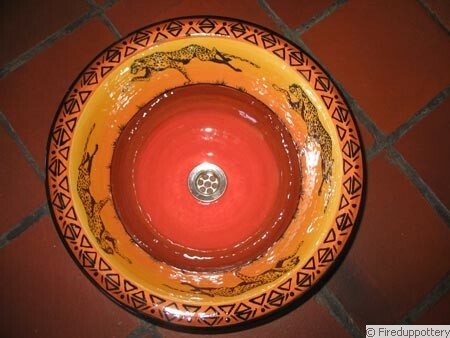 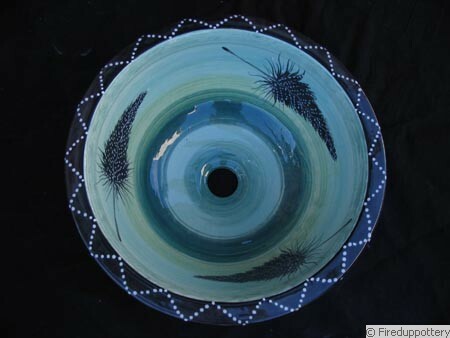 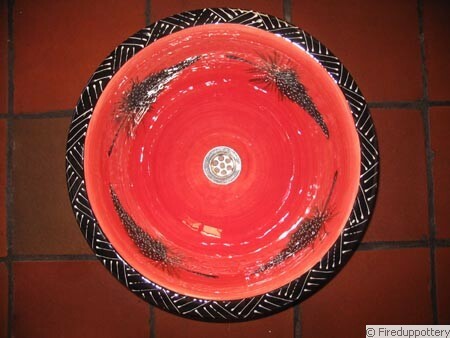 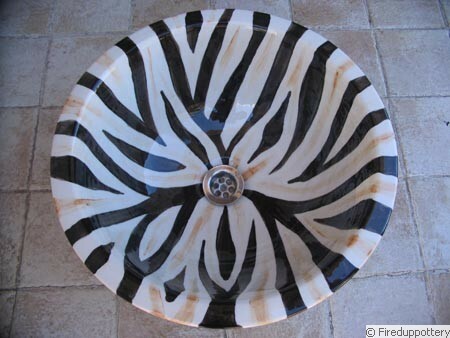 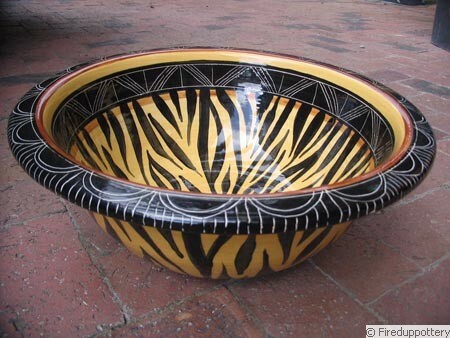 Fired Up Pottery Studio have been supplying interior designers, guest houses, hotels, game lodges and large plumbing warehouses with our high quality handmade wash basins . 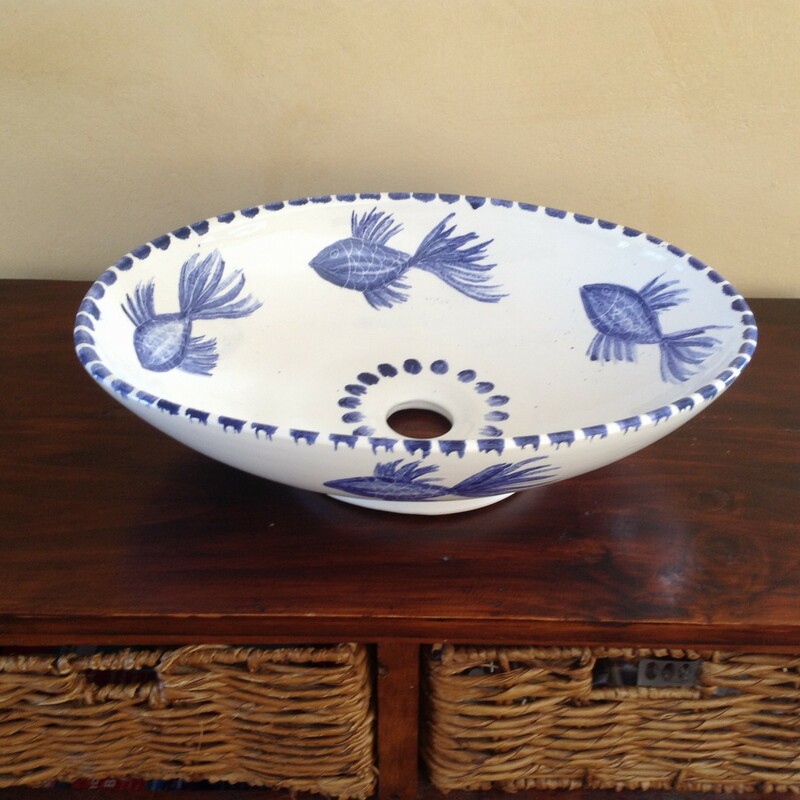 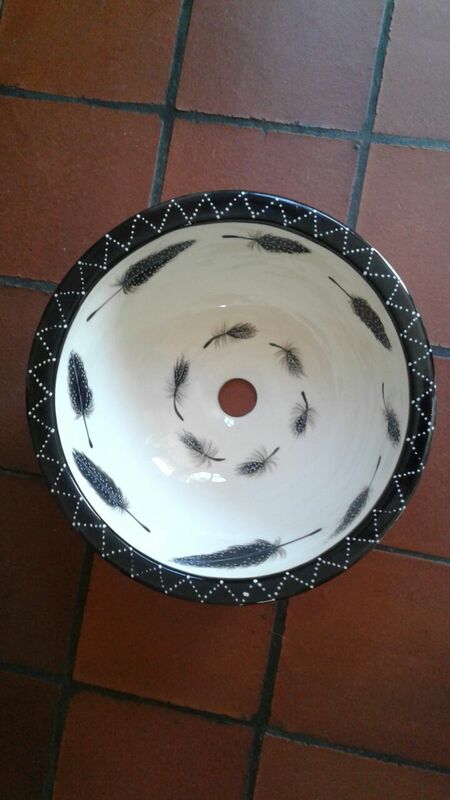 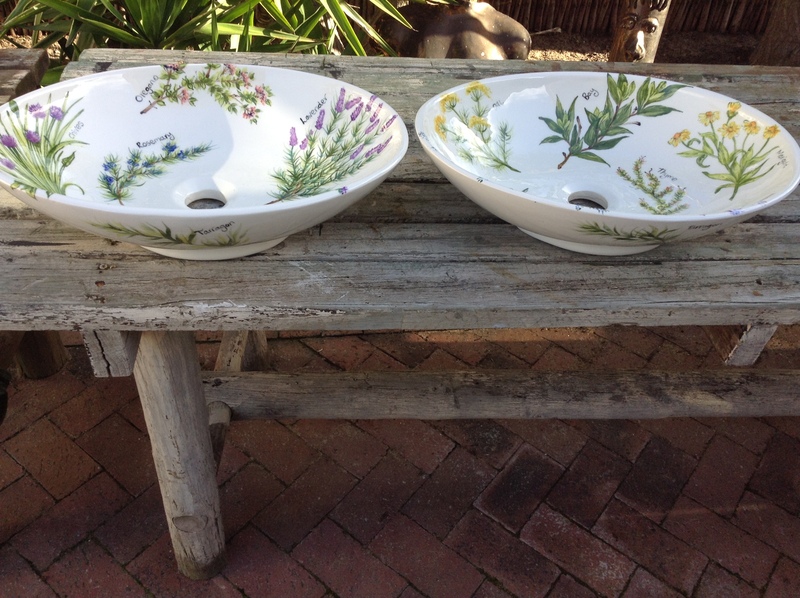 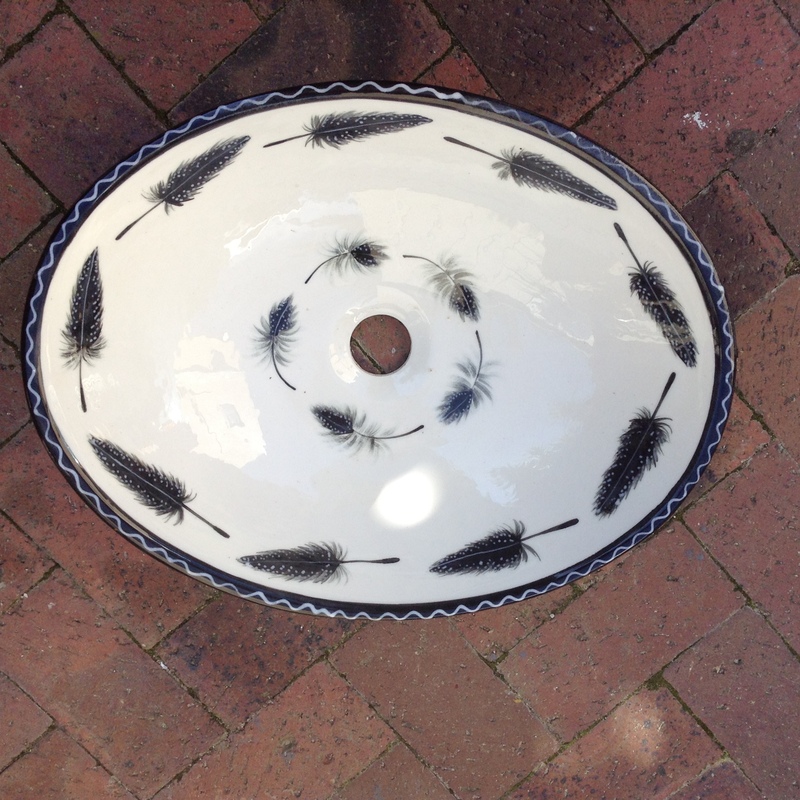 All our handmade wash basins are practical as well as beautiful, and are suitable for use in bathrooms kitchens, braai areas etc. 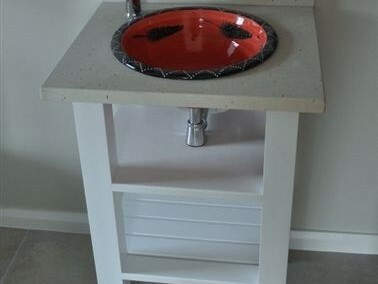 They are easy to install, can free stand, or drop into counter tops and cabinets . 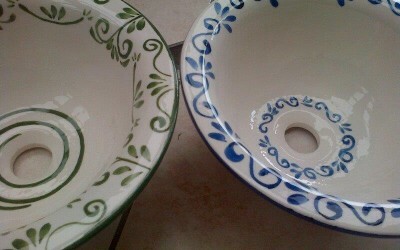 They accommodate a regular plug fitting . 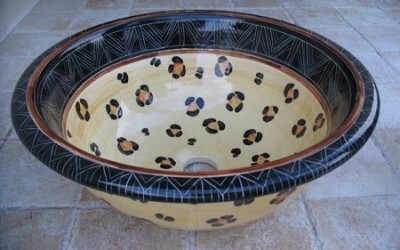 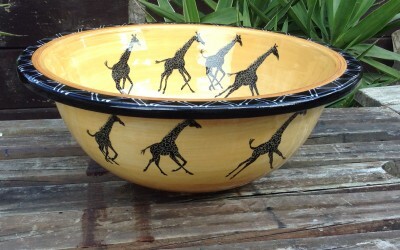 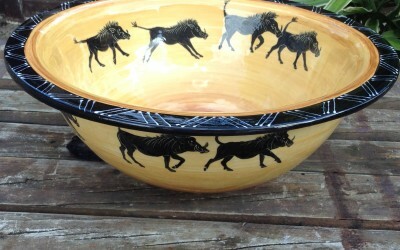 Each item is hand molded,turned,and hand painted . 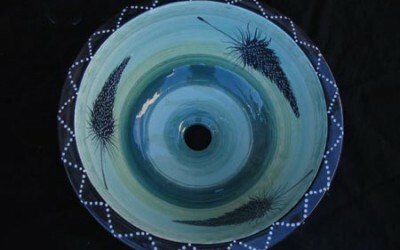 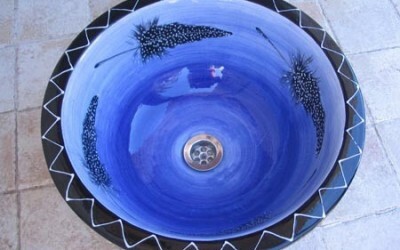 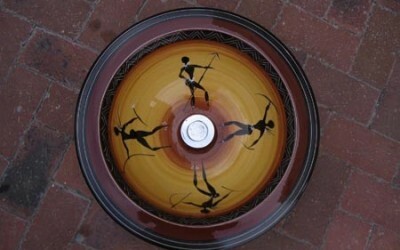 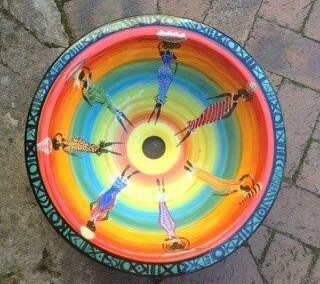 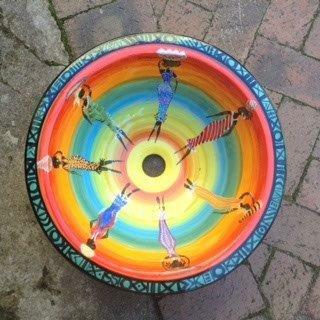 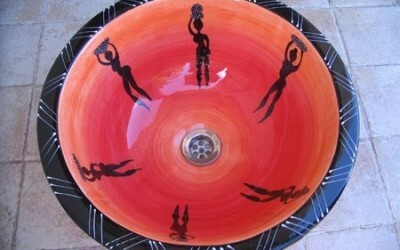 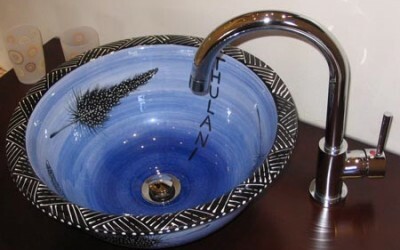 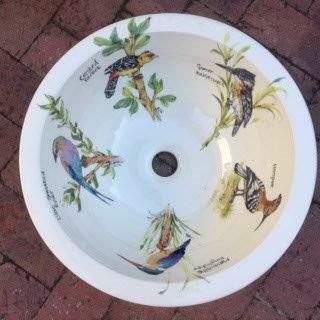 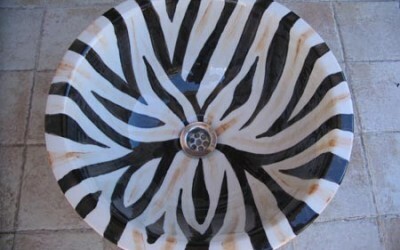 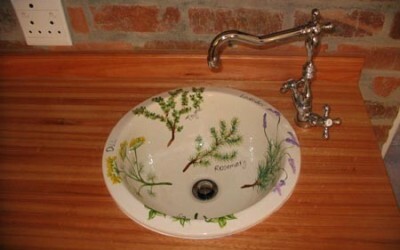 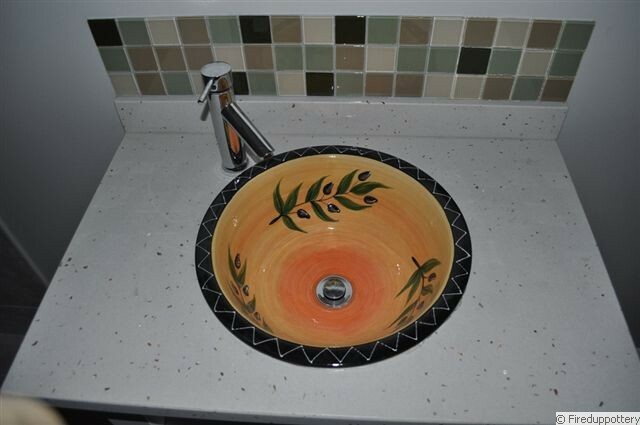 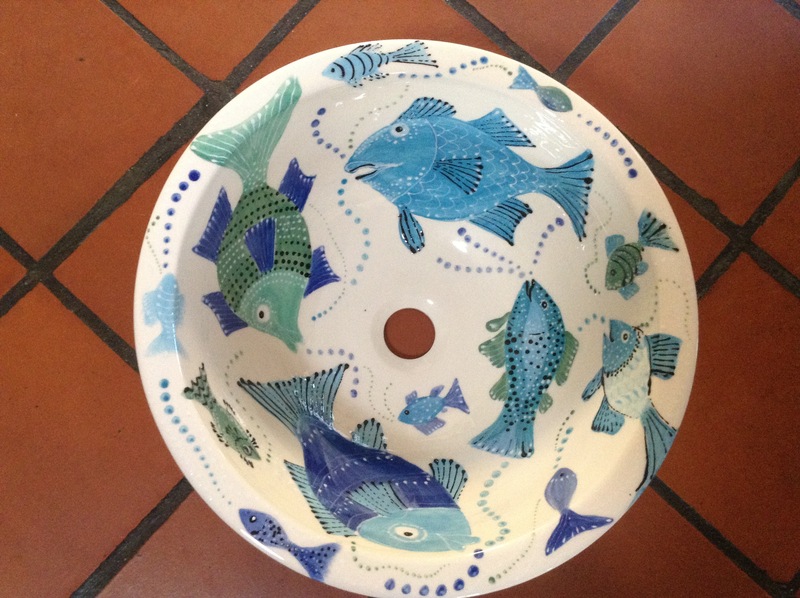 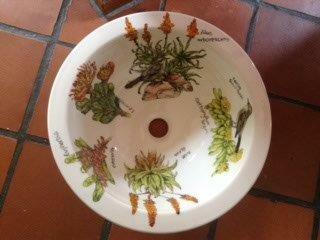 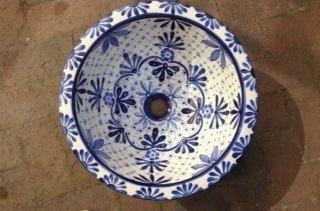 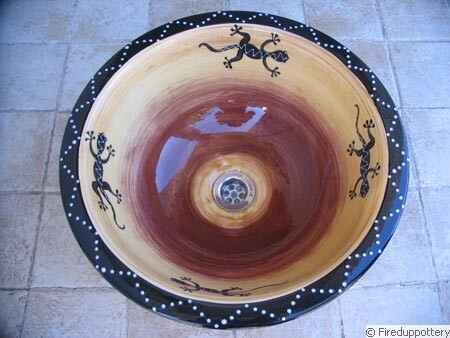 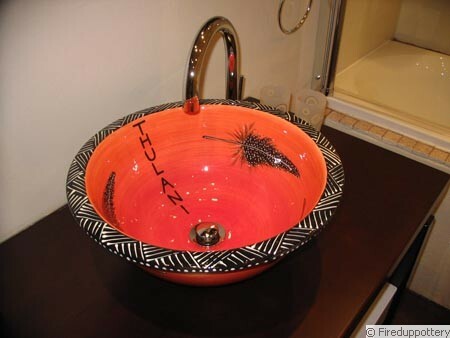 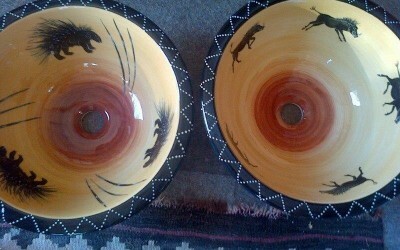 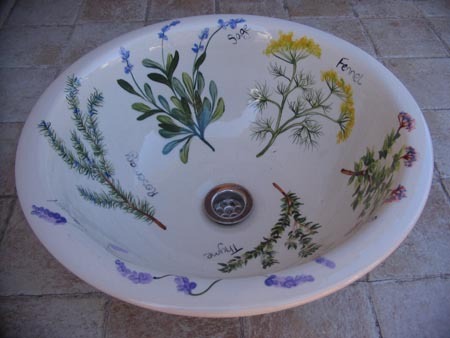 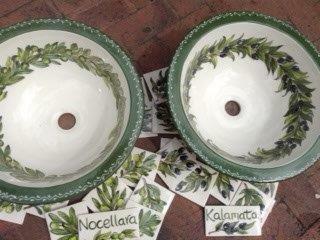 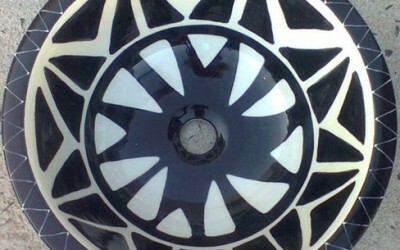 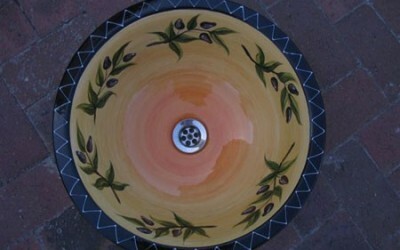 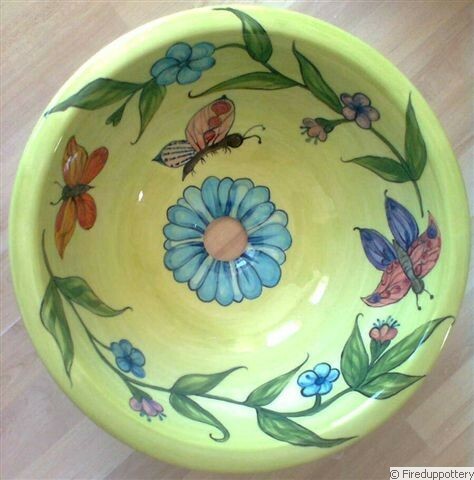 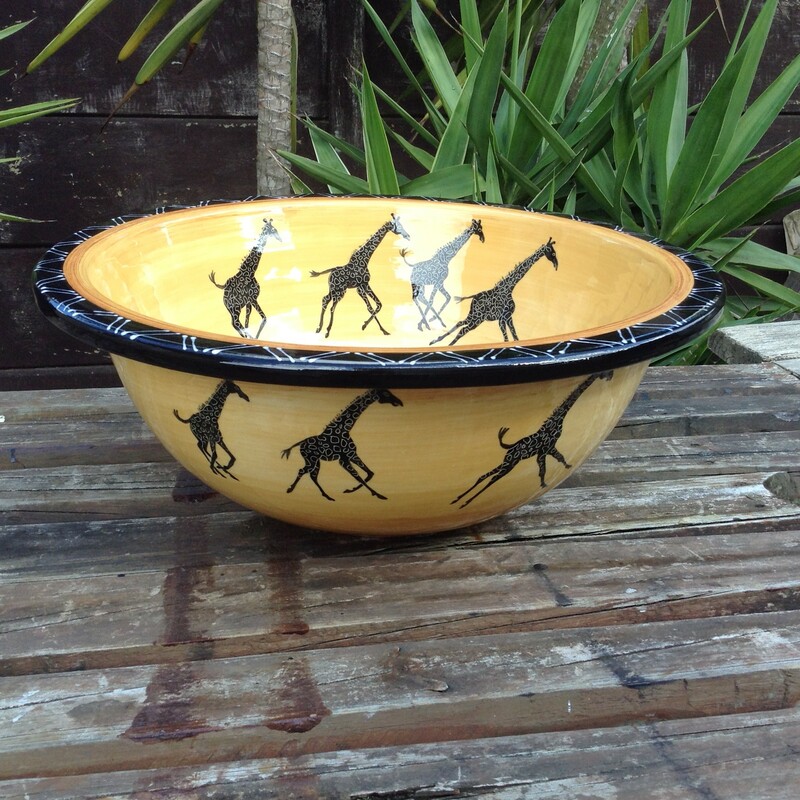 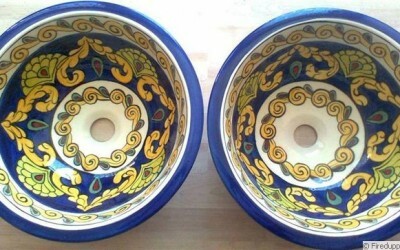 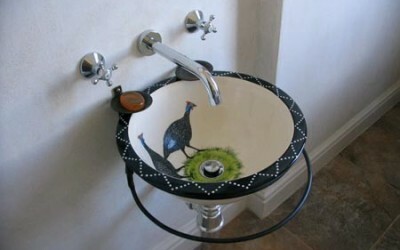 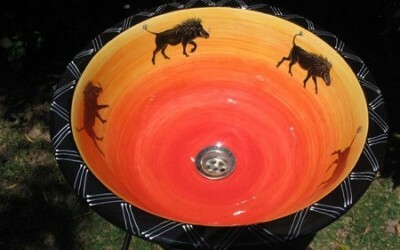 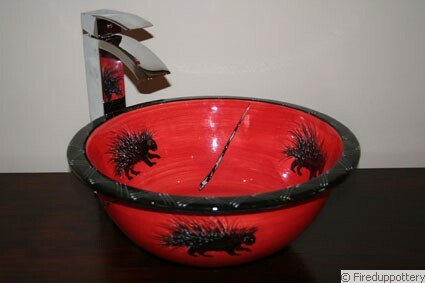 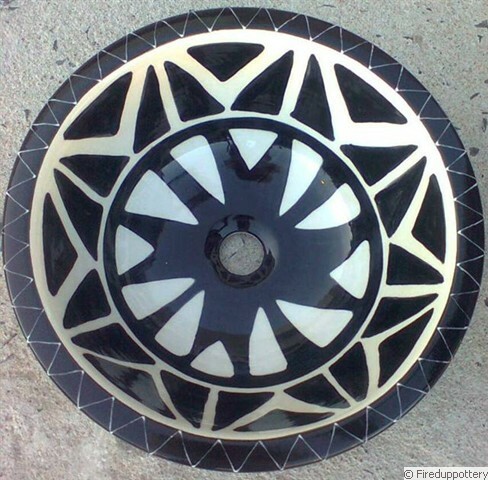 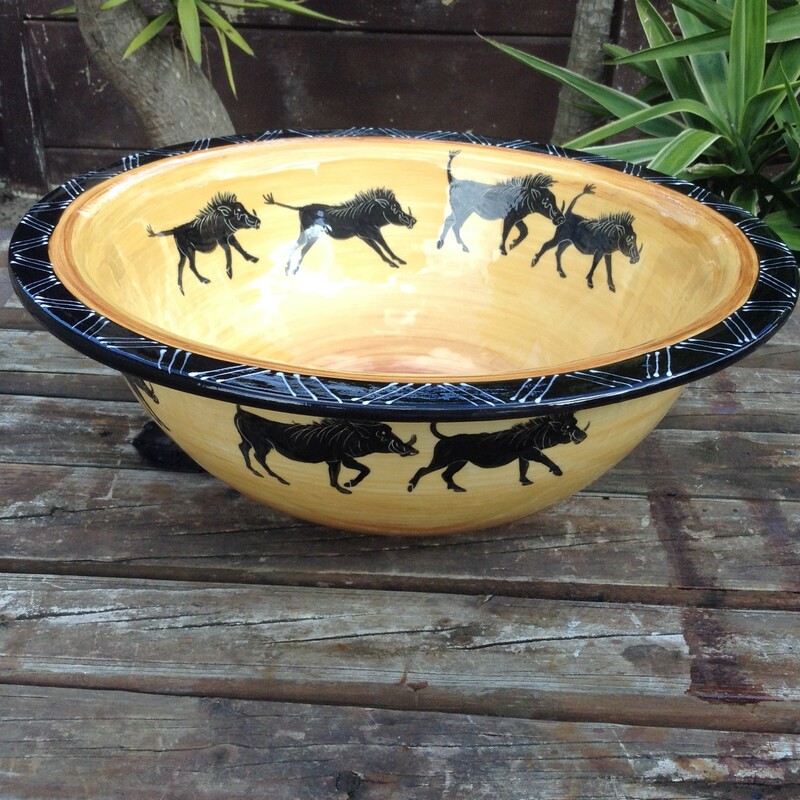 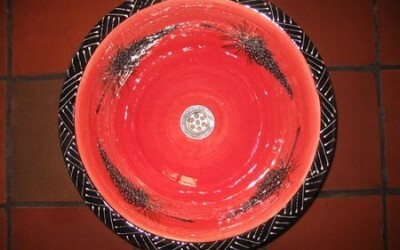 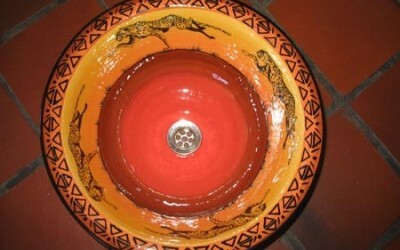 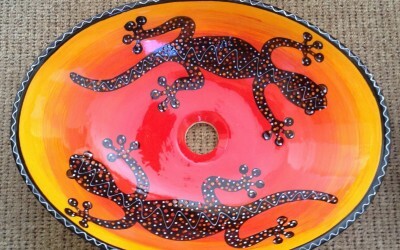 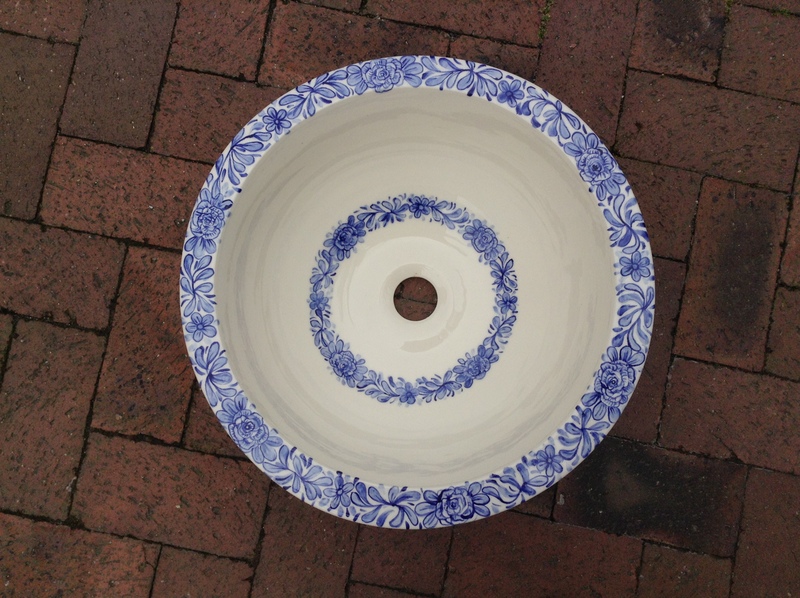 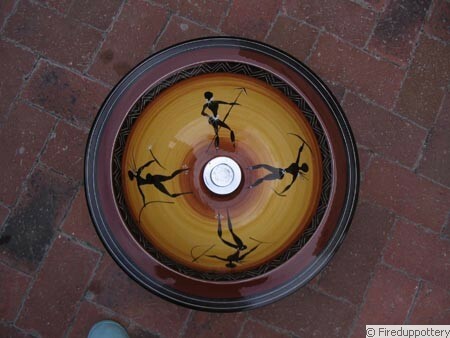 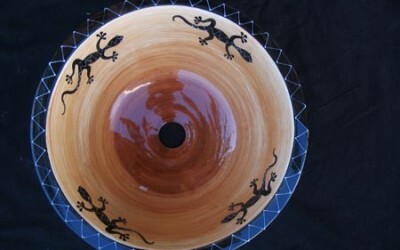 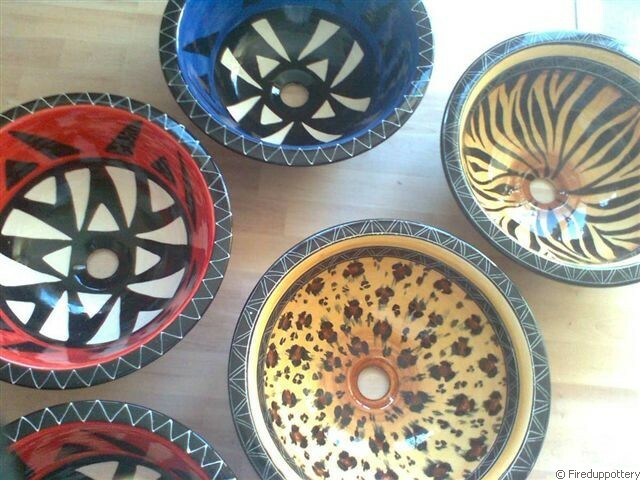 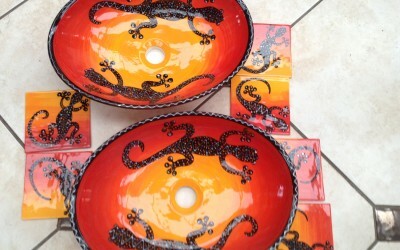 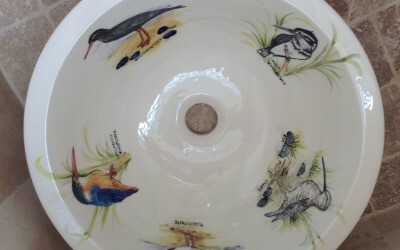 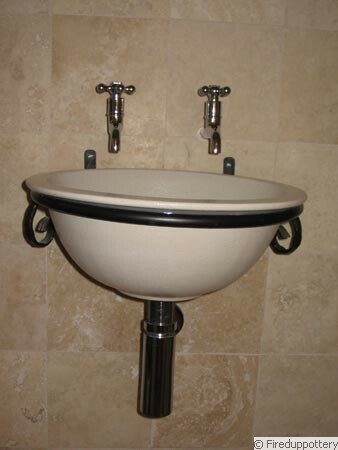 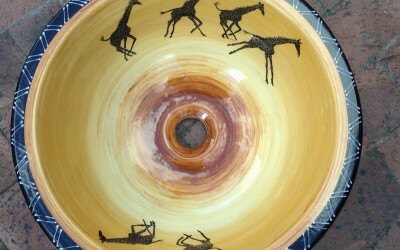 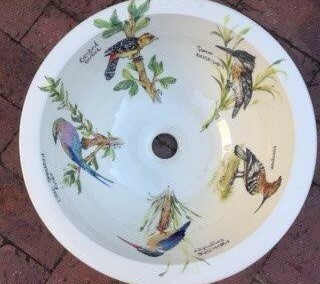 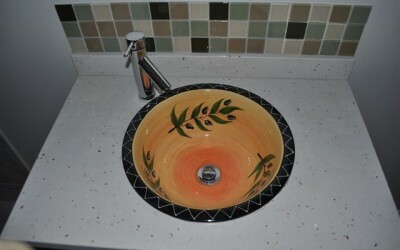 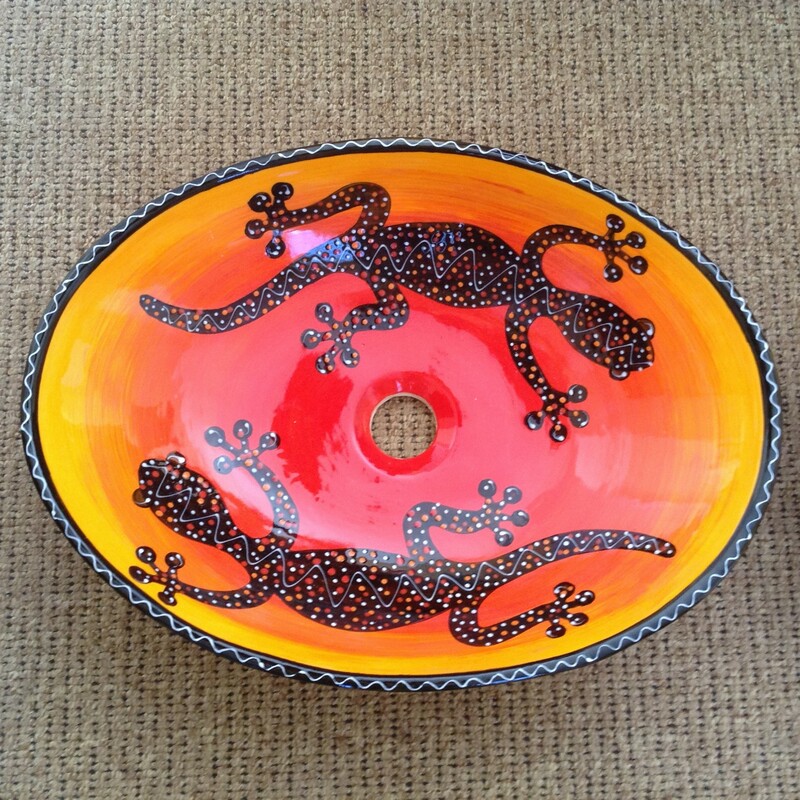 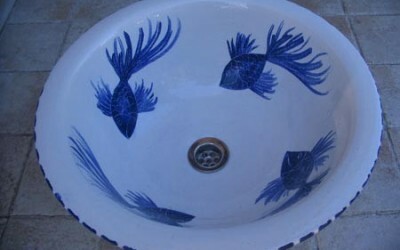 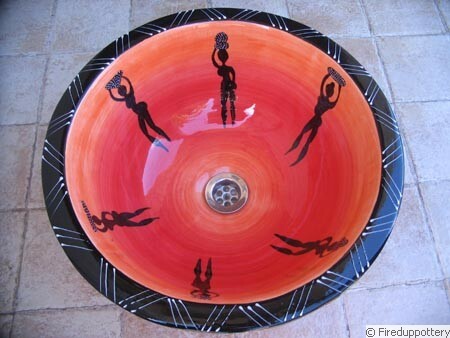 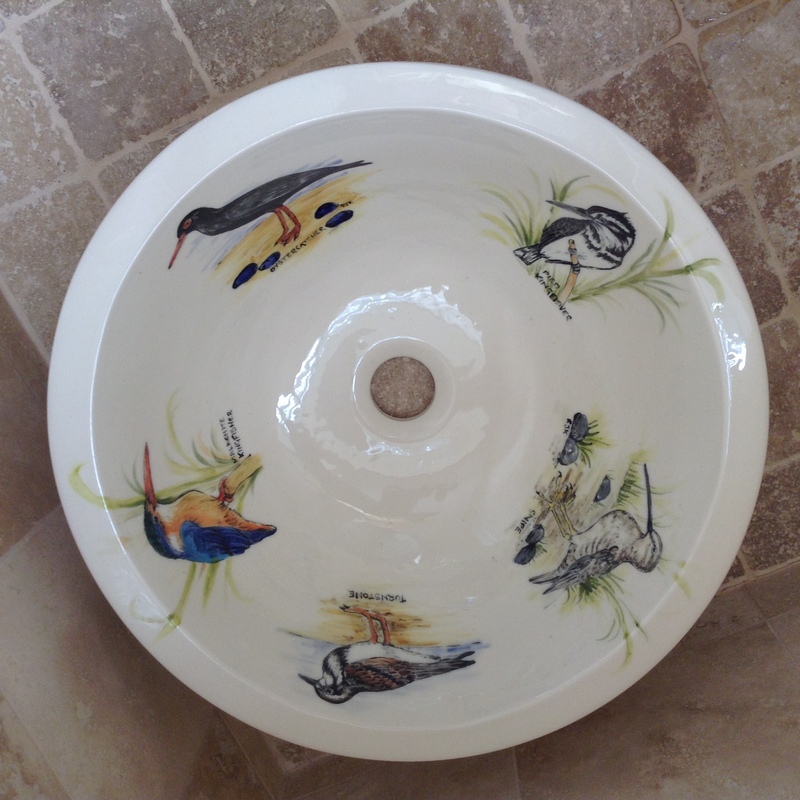 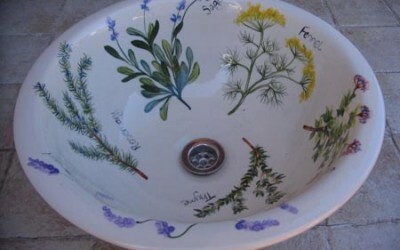 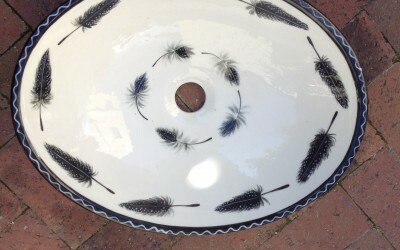 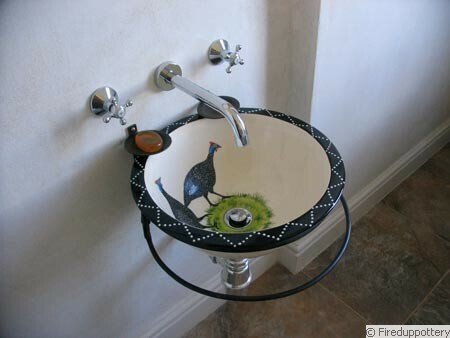 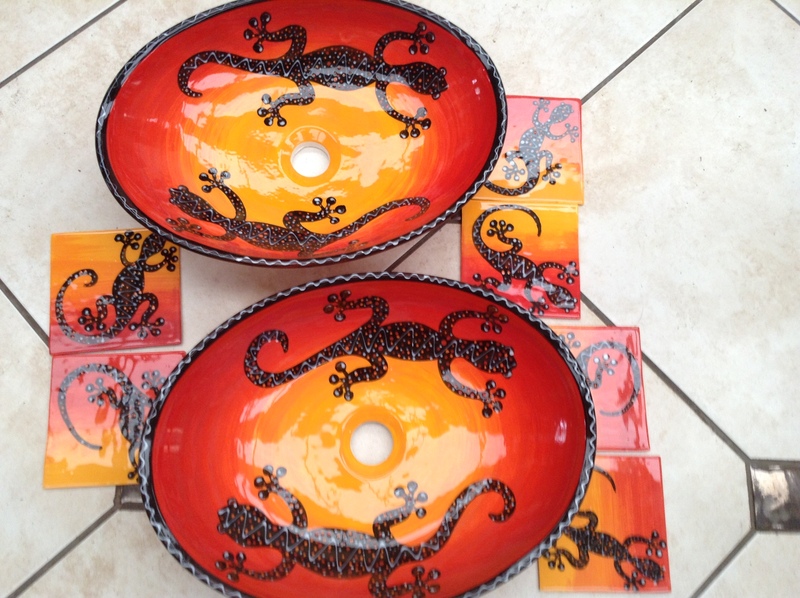 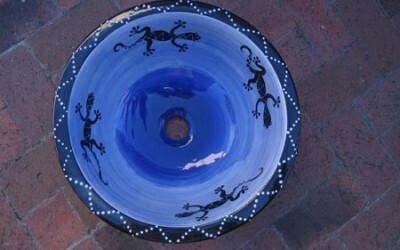 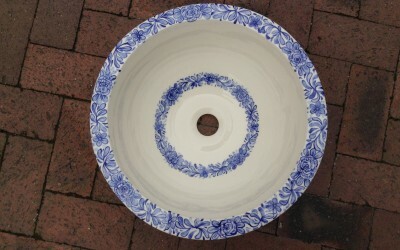 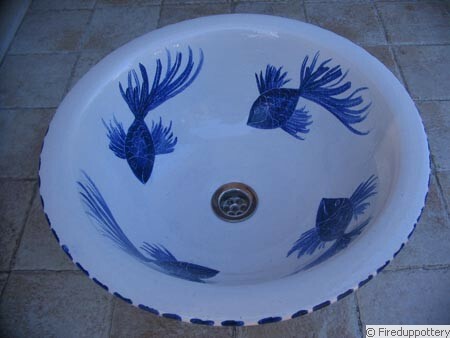 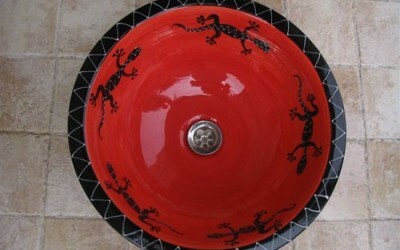 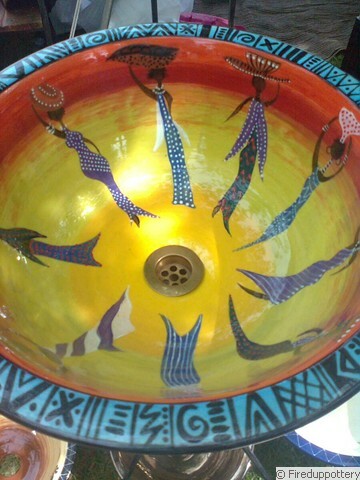 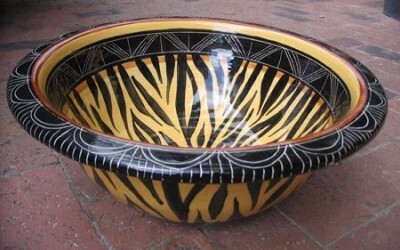 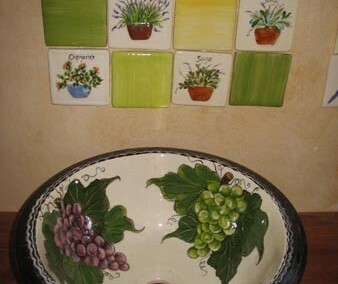 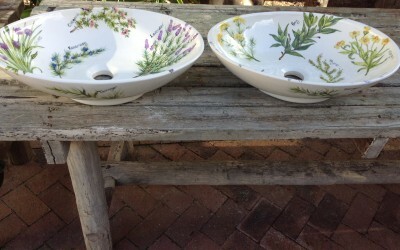 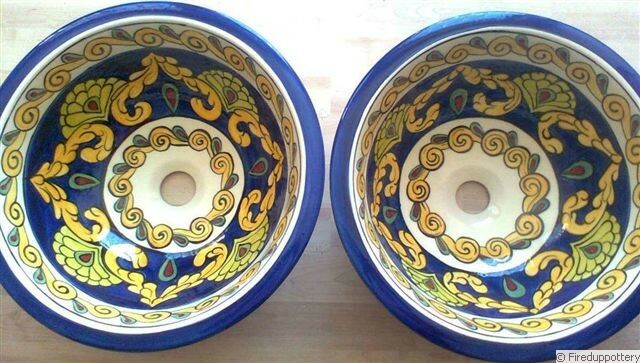 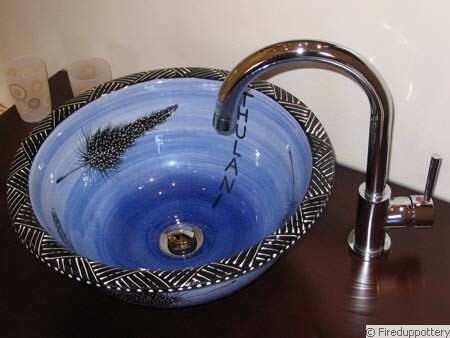 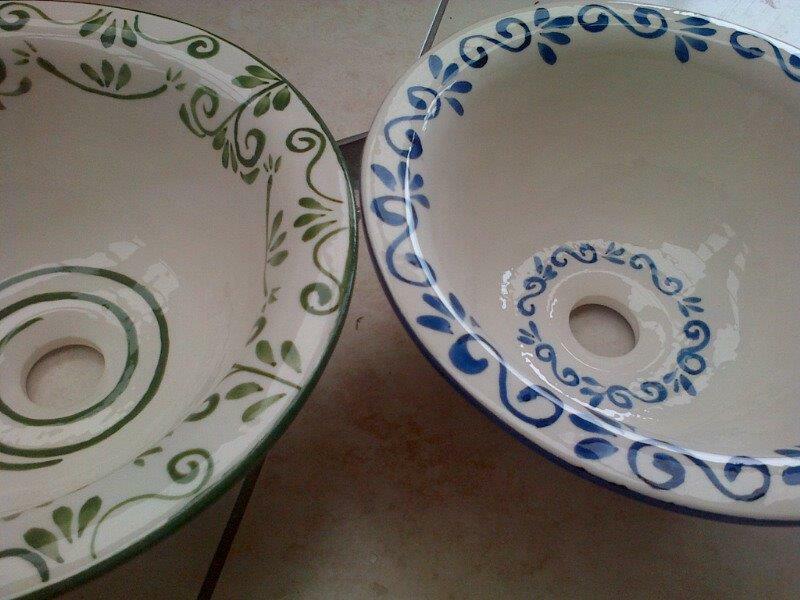 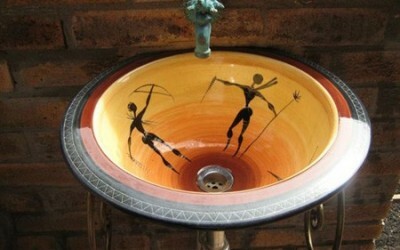 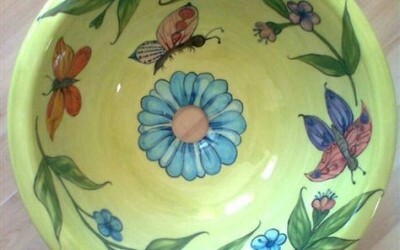 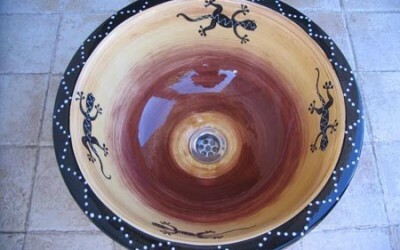 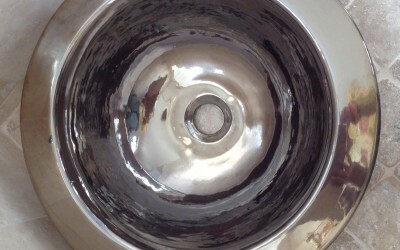 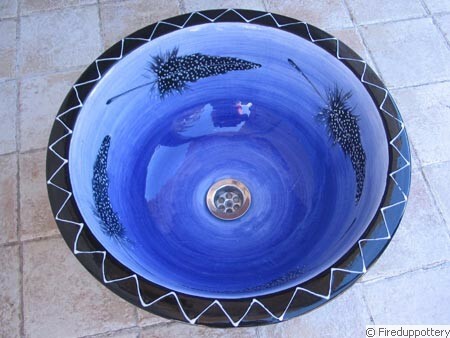 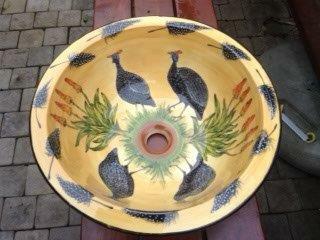 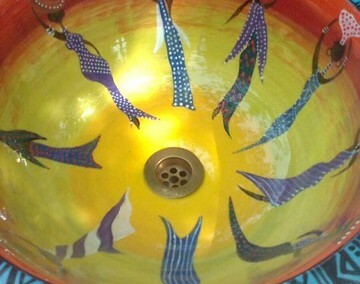 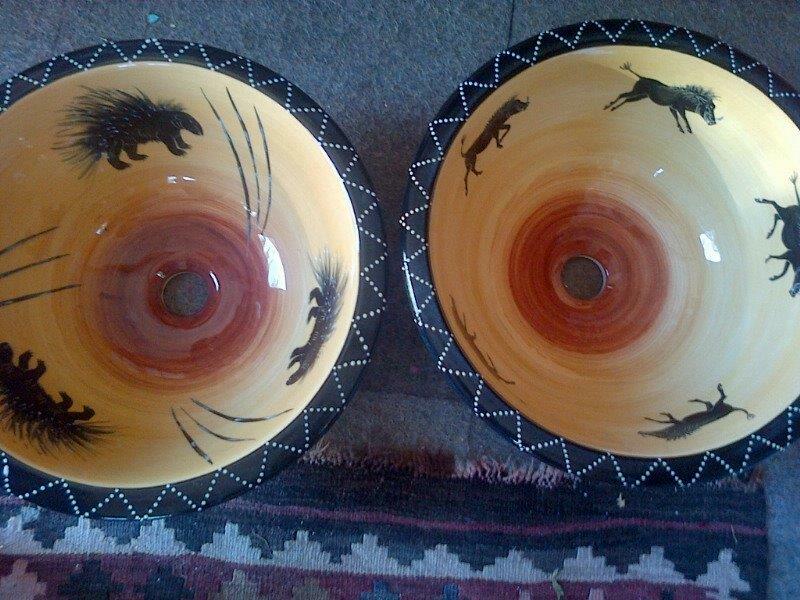 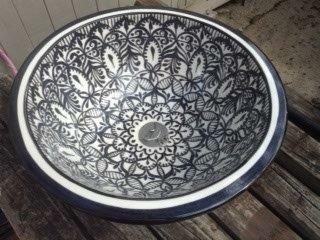 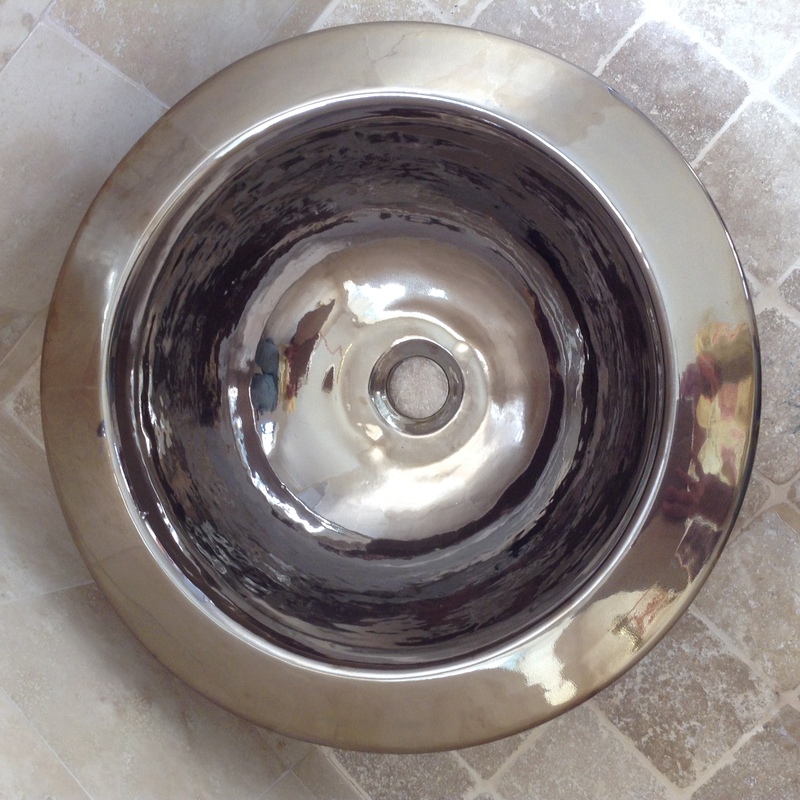 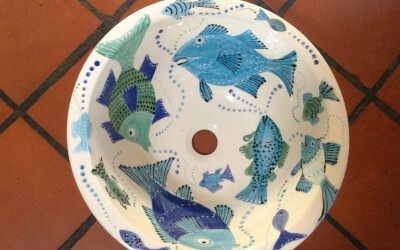 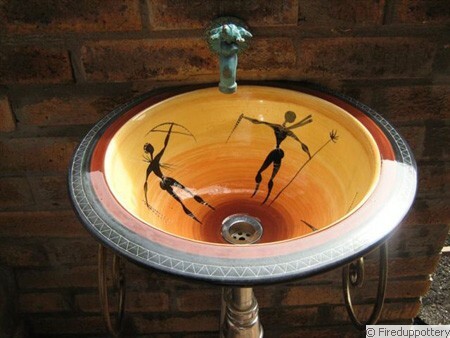 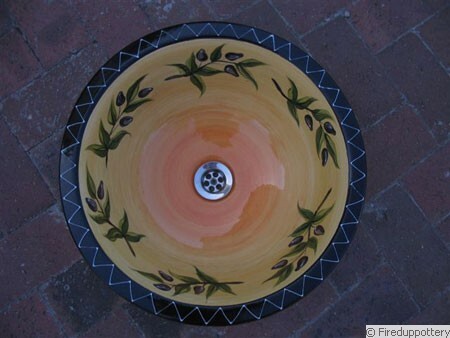 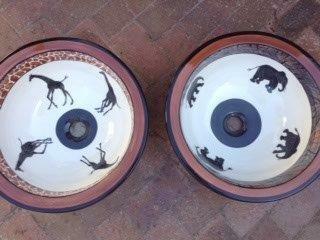 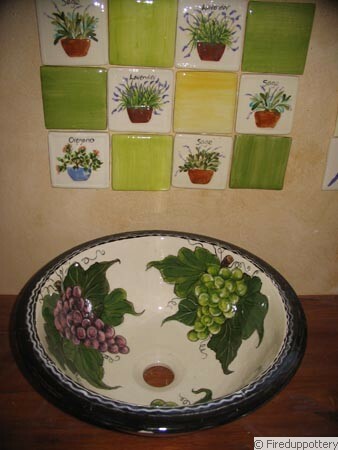 As each of our basins is individually hand made we can be commissioned to paint exclusive designs to suit any client. 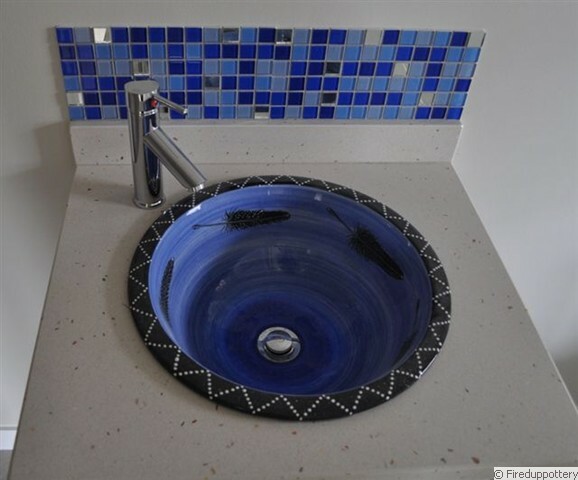 This service has proved particularly popular among hotels and guest houses, not to mention customers who need to match tiles, granite or fabrics. 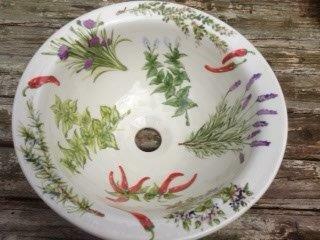 Slight variations can occur due to hand made process, prices quoted exclude postage and packaging. 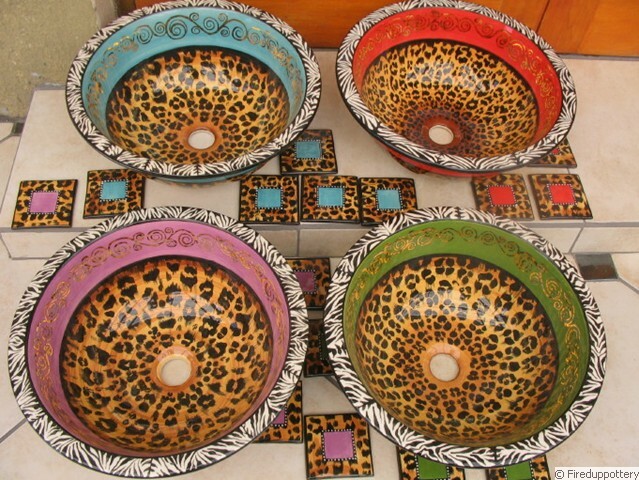 Wholesale rates are available on request. 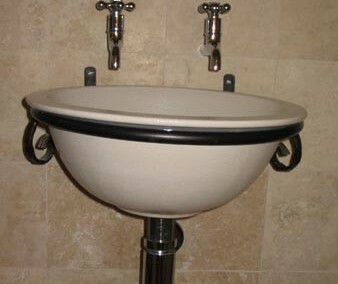 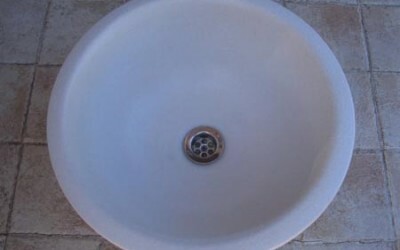 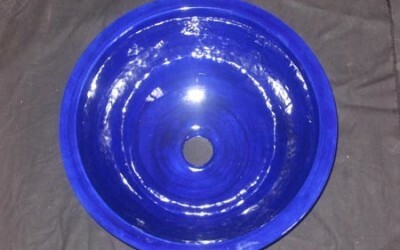 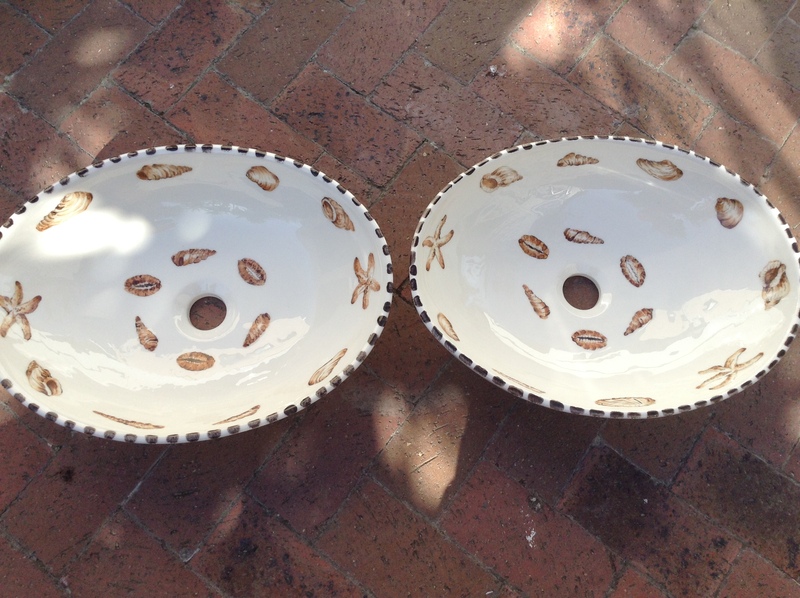 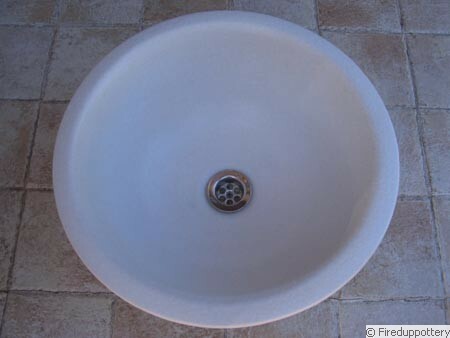 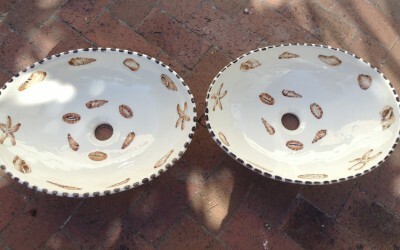 Basins are available in three sizes: Small, Medium and Oval. 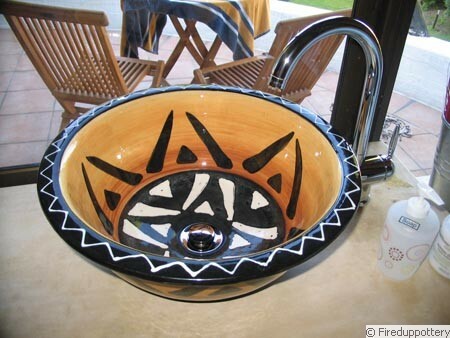 Prices range from R 1000 – R 1800.